February « 2014 « Yeah, right! First of all, just coming up with an acceptable equivalent in English seems to be a challenge for translators around the world. Go to linguee.com, a well-intended but often errant translating reference service which, instead of computing the word or phrase that you are looking for into another tongue, provides you with a series of previous attempts done by other human translators who have contributed their texts. It is an interesting approach because it can assist you in finding that elusive linguistic transformation you seek, but on more than one occasion, it helps you realize that there are a lot of incompetent experts out there, and reaffirms yourn faith in technology. Here are some of the jewels the unwary investigator might get duped by: “entryphone telephone” (which is more of a definition than a translation); “little phone” (a half-hearted literal translation, especially since there little “little” about it); “telephone/monitor” (this time a physical description of the modern models); “portable phone” (there is hardly anything portable about this fixed fixture – your 50kg washing machine is easier to remove); and finally “intercom” (which probably stands as the closest relation). Coming from residential Greenwich, Connecticut, I didn’t encounter a telefonillo at all in my youth, aside from a friend’s house which was so big one was used to communicate between members of the family. Ironically, one of the few homes I know in that town which actually use one of those systems from the outside gate is my original house, which breaks my heart. It was sadly transformed from a home which was so open that every living creature around for miles, children, dogs and cats, felt free to trespass as they pleased, to a kind of cold and uncharacteristic fortress of sorts. Alas! These things happen I guess. 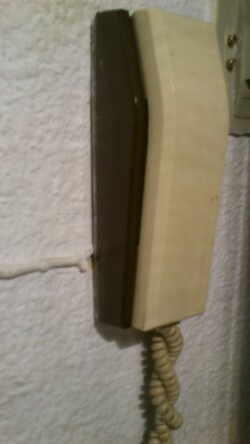 The telefonillo is a ubiquitous feature of every flat and many independent houses, and in my opinion is that their charm resides in two features: their apparent poor manufacturing and their sketchy reliability. The first is apparent from the minute you hold the receiver in your hand. So light and airy, it seems to be hollow, and you are tempted to pry it open on one side to check if there is anything inside keeping things in order. I suppose appearances could be deceiving if it weren’t for the fact that so many of these specimens end up working about as pitifully as you would expect them to. Such is the case, that for the most part, I consider these malfunctions to be a standard part of the device’s performance. Sort of like the scratchy inaudible speaker system on New York commuter trains. One thing that almost never fails is the strident buzzing sound that raids the silence of your abode to announce that someone on the street wants to reach you. If your building doesn’t have a doorman, more often than not it some poor sod trying to slip into the building to mete out publicity into the mailboxes. You can usually pick up on that because the buzzing is short and it spreads throughout the building, as the brochure deliverer relies on the basic laws of probability. 1) You hear the person downstairs > They can hear you. 2) You cannot hear the person downstairs > They can hear you. 3) You can hear the person downstairs > They cannot hear you. 4) Neither side can hear the other. As you can see, you have really about a 25% chance of communicating with the voice on the other end. Either that or you end up conversing with neighbor from the flat two floors down who has also picked up. “Who’s this?” He replies with the same question because he isn’t given to shouting out his name to a total stranger. During this period, the commercial postman is trying to interject and get inside the building. “Can you open me up?” But the others aren’t listening. The round of questioning can go on perpetually, until one gives. “No!” cries out the other neighbor. Try later. I hang up and wash my hands of the matter. The guy with ads will finally coerce someone into letting him in. It never fails. I have mixed feelings about those people. I know they are doing their job, but I just don’t like the fact they assume we have to open the door for them. Especially when there is a box outside. The final obstacle is the button that actually lets you in. I would say that more often than not, it fulfills its purpose, but rarely without an air of mystery, since once you have let go and checked to see if they are inside, there seldom is a reply. Occasionally, you detect a distant echo as if they are calling you from a cave “I’m in!”, but generally, silence is the answer. And if you have decided to let in some stranger who claims to be a person only out to stuff mailboxes, you pray their intent was not something more malicious. Thank God Madrid is generally a very safe city. Some friends of mine prefer the machine-gun method of pressing the button, requiring that I time pushing the door open with the moment. Statistics prove I often need to ring up again. I don’t know why they do it that way. Maybe tradition. That makes sense, because many of the traditions that we all hold dear make any sense at all, which eventually constitutes a dear part of their charm.